Yes, this museum is about steam and bygone days. But did you know that steam is still used at a large scale? No? Well, electric power stations use steam turbines to deliver the greater part of our daily needs! 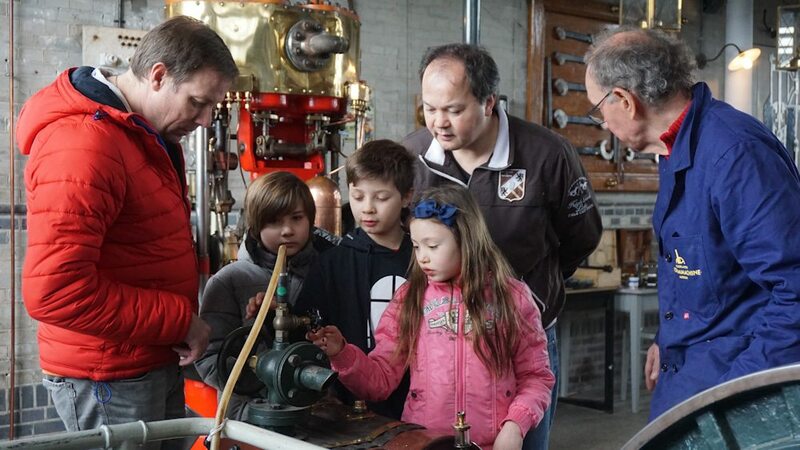 We can show you the third oldest industrial steam engine in the Netherlands, built in 1851 in Rotterdam as well as a marine steam engine of 1935 and everything in between. Our wonderful model of a Newcomen engine stretches the history of steam even back to the beginning of the 18th century. The collection was brought together by “steam mad” shipyard owner Kees Jongert and this is the core of the present museum, which opened in 1985. What can you expect? Industrial steam engines of Dutch, German and British make and marine engines made in the Netherlands and Belgium. Our Lancashire boiler is a Dutch product. Around 100 days per year we are “under steam”, chiefly during school holidays. If you’ll visit us on one of the other days we can run some engines on compressed air, including the old boy of 1851. The museum is established in the old pumping station “Vier Noorder Koggen”. The land in this part of the country is far lower than the average sealevel. It was not always like this. Natural causes and influence by man caused soil subsidence. In other words: the land is about three meters lower than sea level nowadays. When it was not longer possible to drain the land at low tide the Dutch had to turn to windmills with paddle wheels, still a common view. Unfortunately paddle wheels can not raise the water higher 1.5 meters. So we needed two in a row. Great! But mills have a weak spot… They need wind. Even in windy Holland the wind force is not always sufficient to run the mills. To make things worse: mills could not deliver water to the former Zuiderzee when the tide was too high. What to do? The Dutch were very late with implementing steam engines. It was not until the 1850’s that steam power became affordable and soon steam power turned out to be cheaper than maintaining a mill. So in 1869 the auxiliary pumping station was built. Just to pump when the mills could not. In 1897 the paddle wheels and archimedean screw pumps were replaced by four centrifugal pumps. Two of those are still present in the old part of the museum. The beautiful steam engines of 1897 were replaced by two electric motors, in 1940. One is still there and we can run it on the electricity of the nearby generator, driven by the Stork engine. In 1907 the building was enlarged and a big centrifugal pump was installed, driven by a Deutz gas engine. This made 15 windmills redundant. This gas engine did not satisfy and was replaced by a steam engine in 1924. The big pump still functions and can deliver 450.000 liters a minute. On “Super Steam Days” we demonstrate this pump, driven by a 550 hp uniflow steam engine. Enjoy the DIY tour package and find the pictures that will fit the questions on the paper. 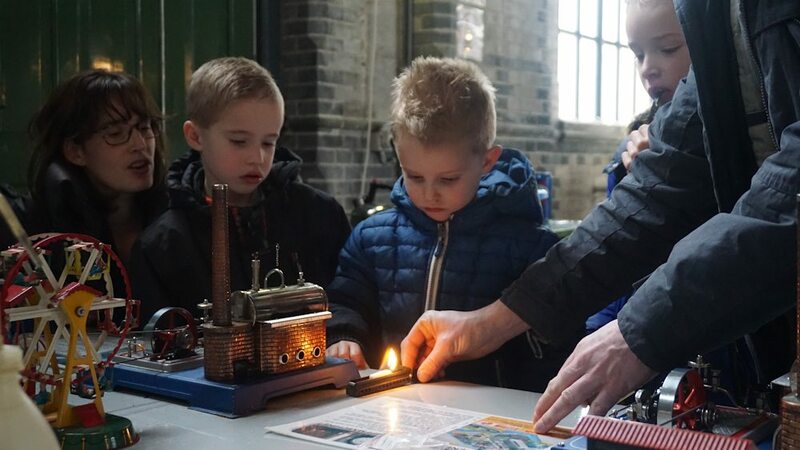 Use the included cube of solid fuel to heat the boiler of a little steam engine and experience the feel of being a heater and an engineer at the same time. And we love to answer all your questions. Really! This year the first phase of a complete makeover of the museum will be realised. The entrance will contain show cases with nearly 100 of our miniature steam engines and other artifacts, all beautifully illuminated. Video displays will throw you back to the bygone days of steam. In the open on the premises behind the museum you will find a stationary steam engine driving a sawing machine, a steam hoisting crane and a tarmac installation. At the very end of the premises you can visit the steam dredger “Vooruit”. At Super Steam Days they will all be running! The machine park shows all kinds of steam engines stored in the open. We hope to have them running some day. Until then you can make very nice photographs of details: blistering paint and rusty parts. And do not be afraid, one-time all engines inside the museum looked the same. During the Summer Holiday the museum is 7 days a week open and at full steam. 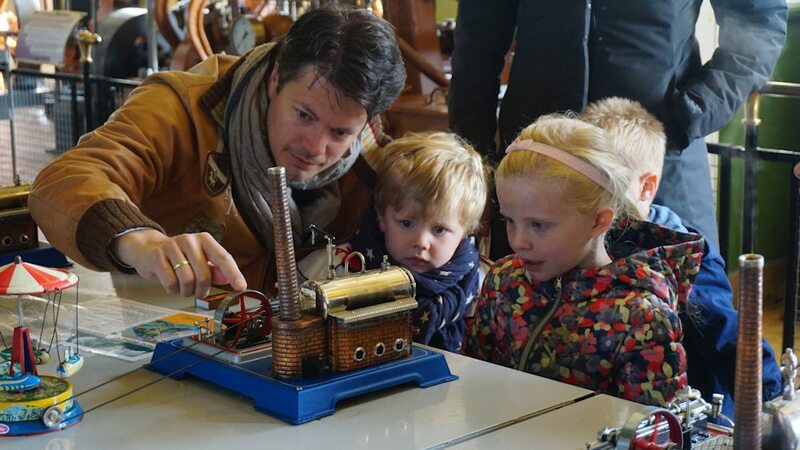 Information about special Events and Steam Days you can find at the website. Children 4 – 18 years of age: € 5,- p.p. Free admission for children under the age of four. For groups and companies we have special arrangements. We have a Visitors Center including a restaurant and terrace. The museum is accessible to wheelchairs. March to November, from 10.00 to 17.00. Monday closed, except in the school holidays. During the holidays we are at full steam 7 days a week.